Well, first trauma was coming out to find only one of the two birds in the nest. Jumping to conclusions, one had clearly pushed the other out, which was cheeping pitifully in the undergrowth beneath. The kids were sent indoors before they started foraging. The mum and dad blackbirds were still around, bringing food to the remaining (guilty) chick. We left them, hoping somehow the other ‘loose’ one would be found by its parents. A couple of hours later, as I was putting away stuff in the shed, I heard a rustling sound under the wheelbarrow, and the smaller chick hopped out, a long way from the shelter of the ferns where it had been earlier. It was exposed, plaintively cheeping at me. Then it hopped back under the barrow. I haven’t seen it since. There are a lot of cats about. 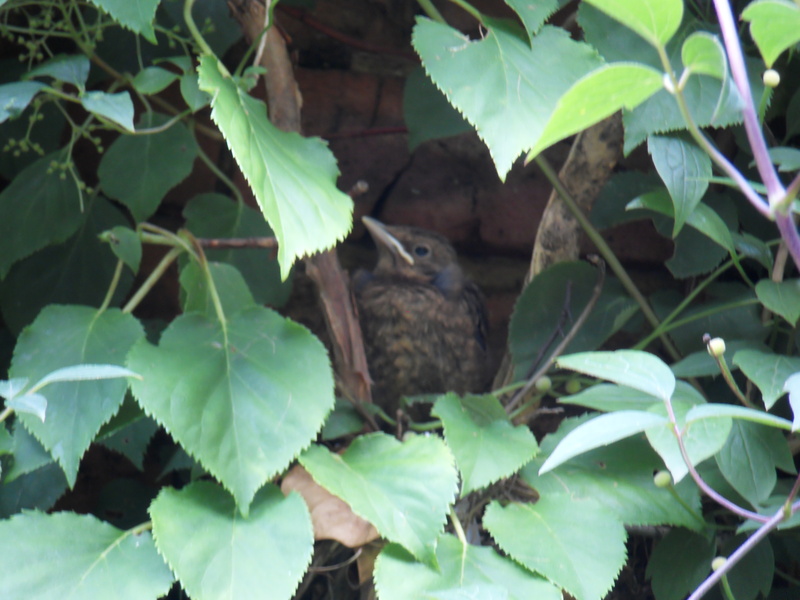 Meanwhile, thug bird had managed to climb out of the nest and right along the clematis, where it sat, camouflaged, still demanding food.